It does indeed look perfect, Juli. 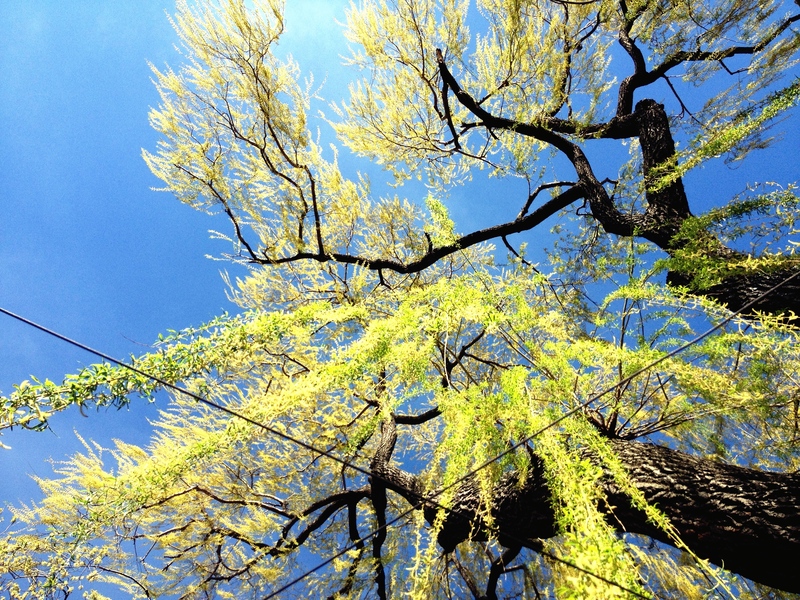 Ah…one of my very favorite images of spring, those bright green leaves against a perfect blue sky! Lovely! Deb! It’s as though Mother Nature said, after the white and greys of winter, the people need a big splash of colour. At least, that’s what it felt like, looking up into that tree and sky overhead. It was such a tonic! Have a lovely weekend! Who could resist that almost-neon spring green glowing against that sapphire blue sky? I even love the crossed wires – marking a great big “X” on this perfect spot. Happy Spring Kick-off! I love that – ‘X’ marks the spot’. Yes! You are so right! 🙂 Happy weekend! Love the burst of color…your point-of-view and framing. And – yes – what a perfect way to kick-off summer! !